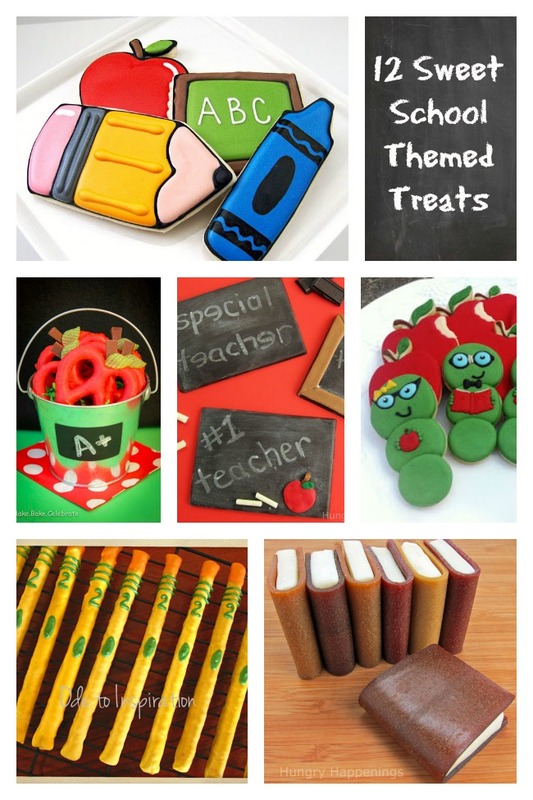 Celebrate the end of the school year by serving up some school themed treats. The school year is winding down and summer will be here before we know it. Many of you will be looking to make some sweet festive treats to bring to your kid’s teachers and classmates. I’m sure if you bring in any of these desserts you will get an A+! From chocolate chalkboards to book worm cookies, this collection of festive desserts will give you plenty of ideas to cook up in your kitchen! If you excel at decorating cookies with royal icing, Sweet Sugar Belle offers some inspiration with her collection of school themed cookies. Give your teachers a bucket full of Make-Bake-Celebrate’s crunchy, sweet, and salty pretzel twist apples to thank teachers for being so sweet. Personalize your own chocolate chalkboards like Hungry Happenings did, to say “thanks” to that special teacher. For your favorite bookworms, you can take a lesson in cookie baking from CookieD-oh and bake up some adorable Bookworm Cookies. Give your kids a pencil that you wont mind if they chew. Ode to Inspiration shows you how to make the perfect pretzel pencils. Fruit leather and white chocolate add up to a super cute edible book. Hungry Happenings will show you how easy these tiny books are to make using three ingredients. What teacher wouldn’t love Oreo Apple Pops? Amanda’s Parties to Go give you an easy to follow lesson on how to make these candy treats. Cupcakes are always a hit at end of school year parties and The Partiologist teaches you how to simply decorate adorable bookworm cupcakes. There are so many cute cupcakes to make, how do you choose? If you want to make super easy Apple Cupcakes check out Love from the Oven’s tutorial. Don’t have time to make and decorate cupcakes, how about baking some snickerdoodle apples instead. You can find the recipe at Burlap N Bling. If you prefer a glue gun to a mixer, then you’ll enjoy crafting Edible Glue Sticks with the help of The Celebration Shoppe. Another crafty project brought to you by Giggles Galore, couldn’t be easier. Her A is for Apple Candy Cups are quick and easy to make and even have printable tags.